In the previous chapter we talked about communication between machines in a generic sense. However, when you have two applications on opposite sides of the Atlantic Ocean, being able to send a packet that may or may not reach the other side is not sufficient. What you need is reliable communication. Ideally, a programmer wants to be able to establish a link to a remote machine and then feed bytes in one at a time and be sure that the bytes are being read on the other end, and vice-versa. Such communication is called reliable stream communication. If your only tools are discrete, unreliable packets, implementing a reliable, continuous stream is tricky. You can send single packets and then wait for the remote machine to confirm receipt, but this approach is inefficient (packets can take a long time to get to and from their destination)--you really want to be able to send as many packets as possible at once and then have some means of negotiating with the remote machine when to resend packets that were not received. What TCP (Transmission Control Protocol) does is to send data packets one way and then acknowledgment packets the other way, saying how much of the stream has been properly received. We therefore say that TCP is implemented on top of IP. This is why Internet communication is sometimes called TCP/IP. The client application (say, a web browser) first initiates the connection by using a C connect() (see connect(2)) function. This causes the kernel to send a SYN (SYNchronization) packet to the remote TCP server (in this case, a web server). The web server responds with a SYN-ACK packet (ACKnowledge), and finally the client responds with a final SYN packet. This packet negotiation is unbeknown to the programmer. The programmer will use the send() ( send(2)) and recv() ( recv(2)) C function calls to send and receive an actual stream of bytes. The stream of bytes will be broken into packets, and the packets sent individually to the remote application. In the case of the web server, the first bytes sent would be the line GET /index.html HTTP/1.0<CR><NL><CR><NL>. On the remote side, reply packets (also called ACK packets) are sent back as the data arrives, indicating whether parts of the stream went missing and require retransmission. Communication is full-duplex--meaning that there are streams in both directions--both data and acknowledge packets are going both ways simultaneously. The programmer will use the C function call shutdown() and close() (see shutdown() and close(2)) to terminate the connection. A FIN packet will be sent and TCP communication will cease. TCP packets are obviously encapsulated within IP packets. The TCP packet is inside the Data begins at... part of the IP packet. A TCP packet has a header part and a data part. The data part may sometimes be empty (such as in the negotiation stage). Table 26.1 shows the full TCP/IP header. The minimum combined TCP/IP header is thus 40 bytes. With Internet machines, several applications often communicate simultaneously. The Source port and Destination port fields identify and distinguish individual streams. In the case of web communication, the destination port (from the clients point of view) is port 80, and hence all outgoing traffic will have the number 80 filled in this field. The source port (from the client's point of view) is chosen randomly to any unused port number above 1024 before the connection is negotiated; these, too, are filled into outgoing packets. No two streams have the same combinations of source and destination port numbers. The kernel uses the port numbers on incoming packets to determine which application requires those packets, and similarly for the remote machine. Sequence number is the offset within the stream that this particular packet of data belongs to. The Acknowledge number is the point in the stream up to which all data has been received. Control is various other flag bits. Window is the maximum amount that the receiver is prepared to accept. Checksum is used to verify data integrity, and Urgent pointer is for interrupting the stream. Data needed by extensions to the protocol are appended after the header as options. It is easy to see TCP working by using telnet. You are probably familiar with using telnet to log in to remote systems, but telnet is actually a generic program to connect to any TCP socket as we did in Chapter 10. Here we will try connect to cnn.com's web page. which says to list all packets having source ( src) or destination ( dst) addresses of either us or CNN. The above commands produce the front page of CNN's web site in raw HTML. This is easy to paste into a file and view off-line. In the other window, tcpdump is showing us what packets are being exchanged. tcpdump nicely shows us host names instead of IP addresses and the letters www instead of the port number 80. The local ``random'' port in this case was 4064. The preceding output requires some explanation: Line 5, 7, and 9 are the negotiation stage. tcpdump uses the format <Sequence number>:<Sequence number + data length>(<data length>) on each line to show the context of the packet within the stream. Sequence number, however, is chosen randomly at the outset, so tcpdump prints the relative sequence number after the first two packets to make it clearer what the actual position is within the stream. Line 11 is where I pressed Enter the first time, and Line 15 was Enter with an empty line. The `` ack 19''s indicates the point to which CNN's web server has received incoming data; in this case we only ever typed in 19 bytes, hence the web server sets this value in every one of its outgoing packets, while our own outgoing packets are mostly empty of data. Lines 61 and 63 are the detachment stage. More information about the tcpdump output can be had from tcpdump(8) under the section TCP Packets. You don't always need reliable communication. Sometimes you want to directly control packets for efficiency, or because you don't really mind if packets get lost. Two examples are name server communications, for which single packet transmissions are desired, or voice transmissions for which reducing lag time is more important than data integrity. Another is NFS (Network File System), which uses UDP to implement exclusively high bandwidth data transfer. With UDP the programmer sends and receives individual packets, again encapsulated within IP. Ports are used in the same way as with TCP, but these are merely identifiers and there is no concept of a stream. The full UDP/IP header is listed in Table 26.2. Various standard port numbers are used exclusively for particular types of services. Port 80 is for web as shown earlier. Port numbers 1 through 1023 are reserved for such standard services and each is given a convenient textual name. All services are defined for both TCP as well as UDP, even though there is, for example, no such thing as UDP FTP access. Port numbers below 1024 are used exclusively for root uid programs such as mail, DNS, and web services. Programs of ordinary users are not allowed to bind to ports below 1024. 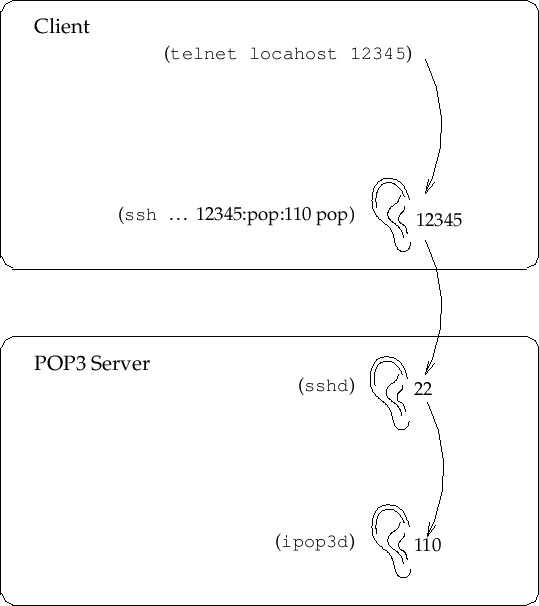 [Port binding is where a program reserves a port for listening for an incoming connection, as do all network services. Web servers, for example, bind to port 80. ]The place where these ports are defined is in the /etc/services file. These mappings are mostly for descriptive purposes--programs can look up port names from numbers and visa versa. The /etc/services file has nothing to do with the availability of a service. Here is an extract of the /etc/services. It should ensure that the connecting client really is connecting to the server in question. In other words it should authenticate the server to ensure that the server is not a Trojan. It should prevent any information being gained by a snooper. This means that any traffic read should appear cryptographically garbled. It should be impossible for a listener to modify the traffic without detection. Here we get results identical to those above, because, as far as the server is concerned, the POP3 connection comes from a client on the server machine itself, unknowing of the fact that it has originated from sshd, which in turn is forwarding from a remote ssh client. In addition, the -C option compresses all data (useful for low-speed connections). Also note that you should generally never use any encryption besides arcfour and SSH Protocol 2 (option -2). and then run telnet 12345 to test as before. With forwarding enabled you can use any POP3 client as you normally would. Be sure, though, to set your host and port addresses to localhost and 12345 within your POP3 client. This example can, of course, be applied to almost any service. Some services will not work if they do special things like create reverse TCP connections back to the client (for example, FTP). Your luck may vary.